I’d been looking for the bonkers Japan since we arrived, and Tokyo delivered. Sure, it’s a capital city much like any other in that it’s full of well-dressed people in a rush to get somewhere, but when the Tokyoites relax, they have an almost unthinkably crazy selection of things to choose from. 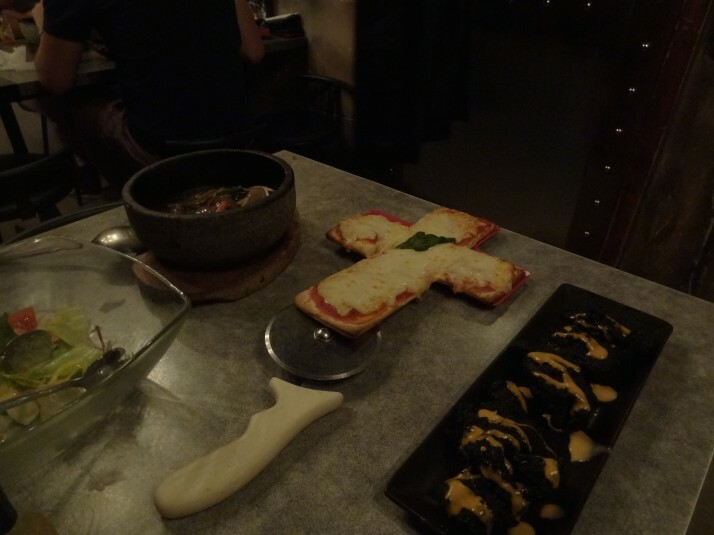 Here are a few of the ones we were brave enough to try, with a few of my other favourite sights in Tokyo. While researching places to eat, I discovered the genre of “entertainment restaurants” and knew this was something we had to try. 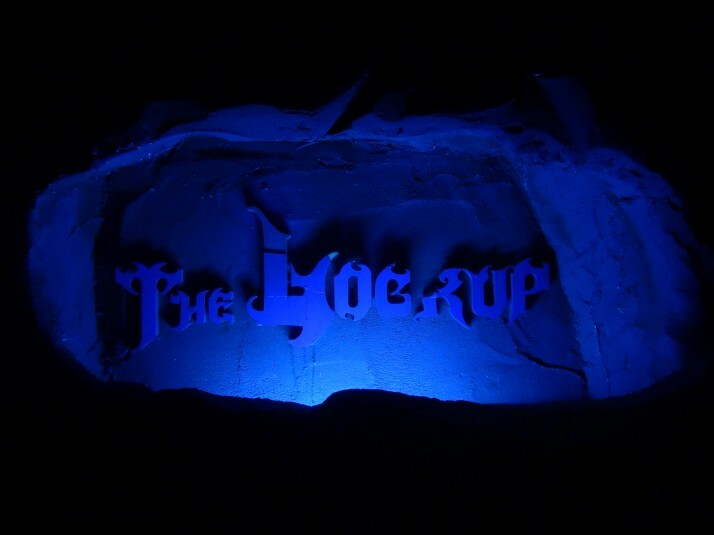 I decided on “The Lockup” and once we’d found it we cautiously ventured down the stairs and opened the door to a dark, empty corridor. If this were any other restaurant we’d have thought they were closed, but we took a few steps in and triggered the lights on a barrel of toxic waste.. up ahead we could make out a hunched-over figure in an electric chair and all the while we were waiting for someone to jump out at us! The haunted castle-like entrance almost robbed us of our appetite, but we pressed on until we reached another door where we were greeted and asked to wait for a table. A minute or so later a waitress dressed provocatively in a cross between an official police uniform and a frilly maid-cafe outfit recited the rules before putting me in handcuffs and leading us to our table! 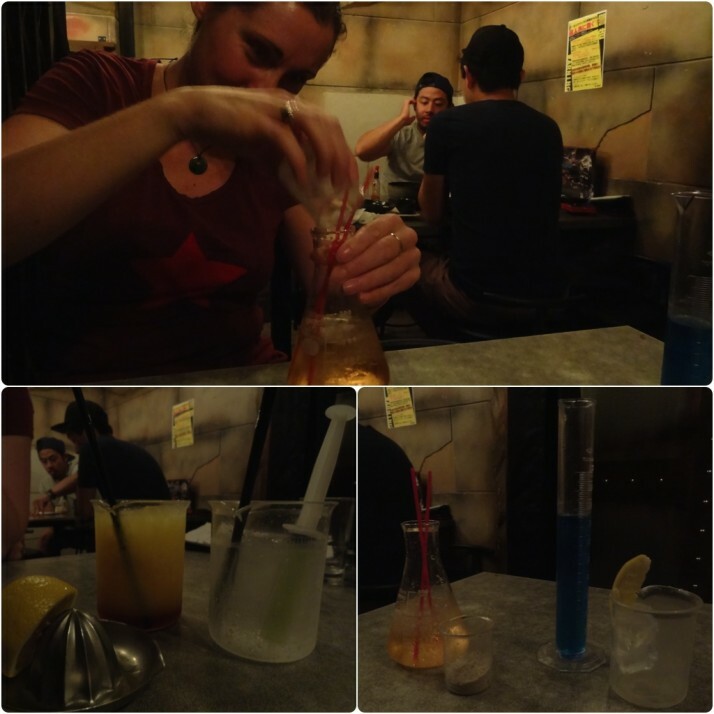 Half of the menu was themed cocktails with names like “Electric shock”, “Human Experiment Z” and “Lethal Injection”, all served in laboratory glassware which was great fun. Our food had just arrived when suddenly the lights went out, a dramatic conversation between a husband and wife started playing over the speakers that quickly escalated into fear and screaming. No-one knew what was going on. The 2 girls on the table of 4 behind us swapped so the boys were near the door to our cell, and then we started hearing real screams from the restaurant that were getting closer.. it was pretty terrifying! I caught a glimpse of something in white rags run past our cell and heard what sounded like a fire-extinguisher going off before the dramatic music faded and the lights came back on! Whew! The cocktails were good fun, and I’d recommend the strongest ones as we couldn’t taste any alcohol in the medium ones. The food was pretty good which surprised us as we’d read mixed reviews, I’d say it was akin to good chain-pub food back home, lots of variety, freshly prepared and tasty too. Akihabara’s reputation for technology started in the 1920s with the opening of an electronic radio parts shop. 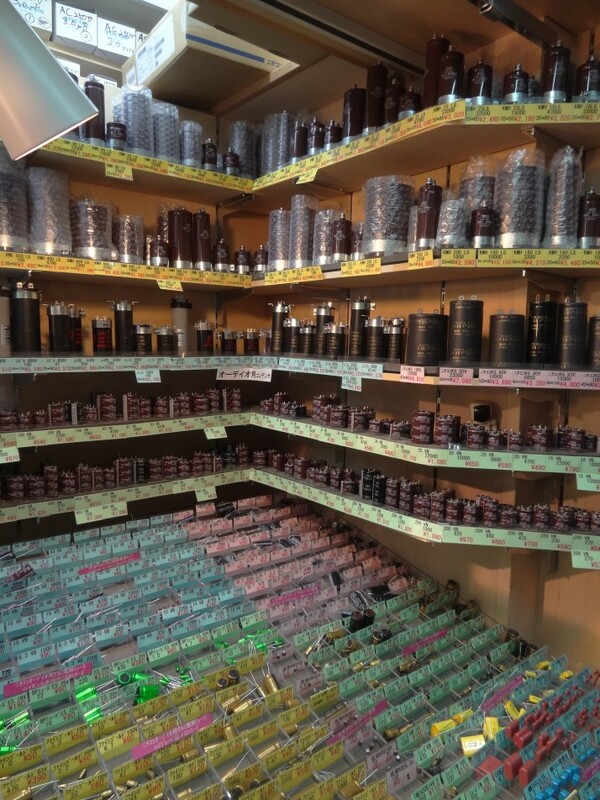 One after another opened up nearby and soon the area was an electrical engineer’s heaven. 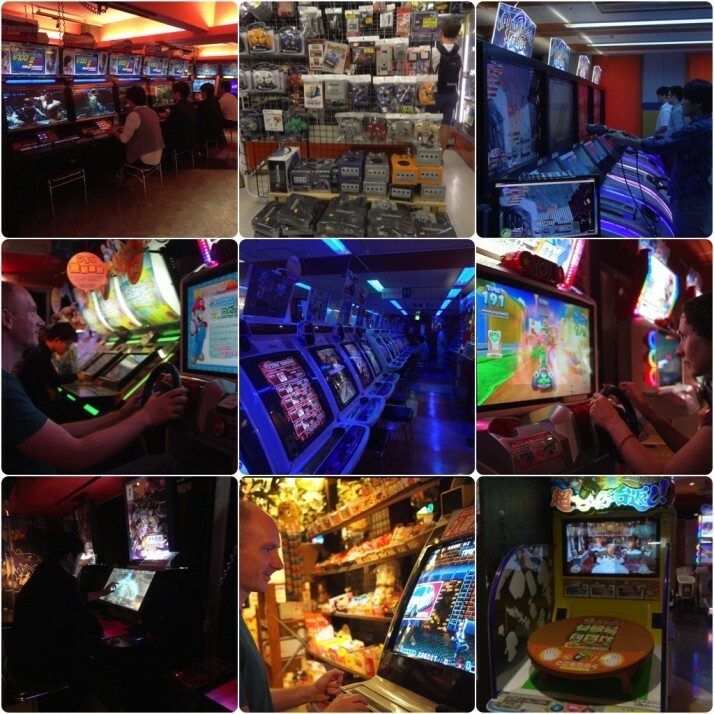 While there’s still an area of electronics supply shops selling all manner of components and gadgets, nowadays Akihabara is consumer electronics, pop music sensation AKB48, geek culture, maid cafes, and of course, the thing we visited for – video game arcades! The multi-floor arcade palaces of Akihabara: One of the two Taito arcades (this one is 7 storeys); Super Potato! 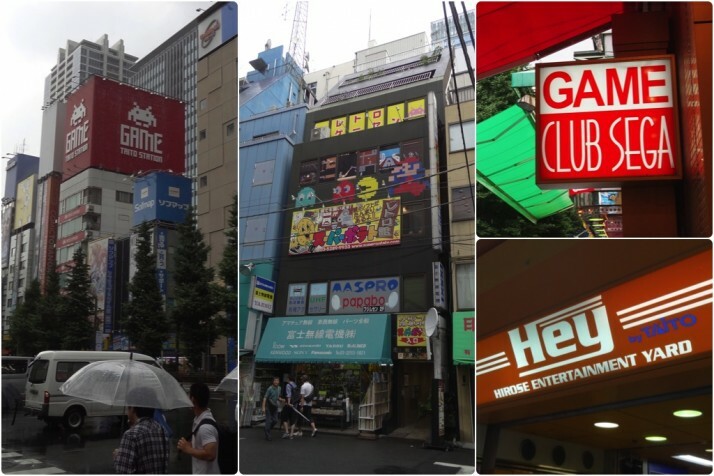 – the Nintendo-focused 3 floors of second-hand games, like a bricks-and-mortar eBay, whose top floor is also a small arcade; Sega also have two multi-storey arcades – Club Sega is 7 storeys; and the Hirose Entertainment Yard – head straight to the 2nd floor! Julie and I (OK, mostly I) playing video games. Oh yeah! From top-left: Rows of beat-em-ups; Generations of consoles in the excellent Super Potato! ; An entire floor dedicated to Gunslinger Stratos 2; Me playing Mario Kart Arcade GP DX; One of the countless rows of shmups in Taito HEY; Julie concentrating hard playing Mario Kart Arcade GP DX (she also came 1st! ); One of about 12 Lord of Vermillion III arcades that seemed to be the lovechild of DoTA and a CCG; Me in Super Potato reliving fond memories of the hours my brother Dan and I spent on Double Dragon; Plenty of inventive arcade games such as this one where you have to flip a table in rage! It was cool to see that the art of the video-game cabinet has moved on apace in Japan. There are entire floors given over to single titles like Gunslinger Stratos 2 and Ultra Street Fighter IV, where all of the machines are connected for multiplayer. Some looked like they were connected to the internet (to other arcades, perhaps?) which could mean city, country or world-wide battles and competitions, and Lord of Vermillion III seemed to involve buying or trading character cards, where the action was controlled by moving the cards on a special surface and issuing commands on a touch screen. All of the arcades were really loud, and sadly we found them to be pretty smoky too. After a couple of hours Julie and I started getting headaches. 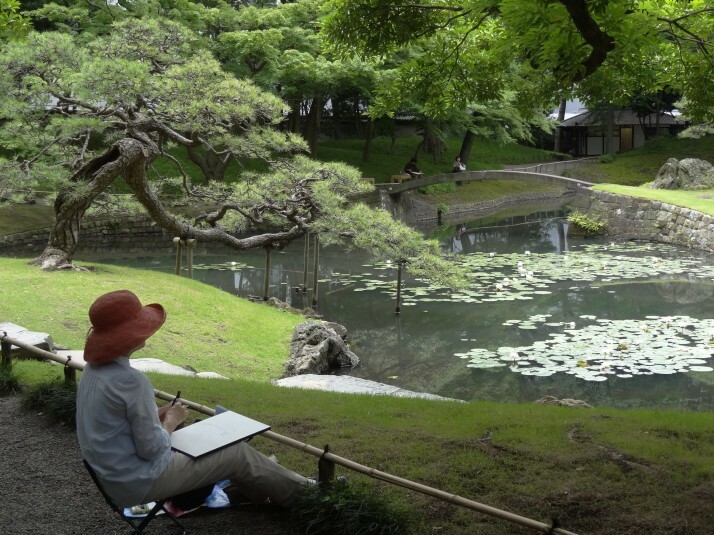 If you’ve been following our adventure, you will already know that I love gardens, and especially Japanese ones. 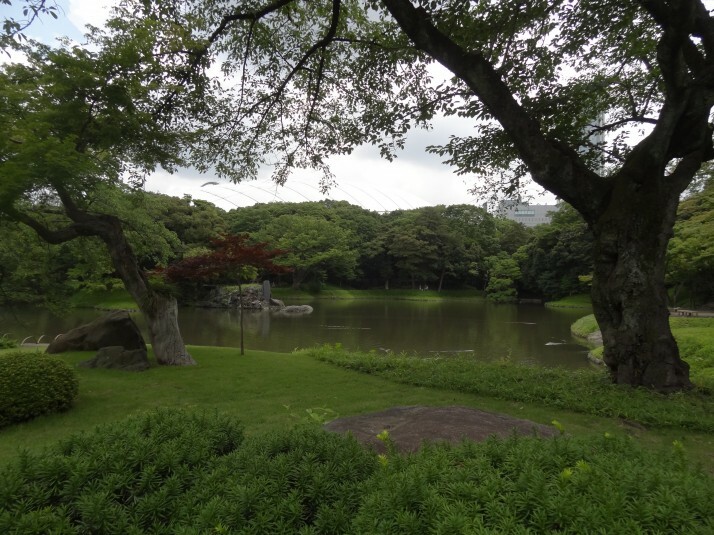 Surrounded by trees, streams and ponds it was easy to forget that we were in the centre of Tokyo – until the theme park next door started blaring dance music at 10am! After a 2 hour stroll, we read on the way out that the garden was originally 4 times its current size – now that’d be a lot of strolling! 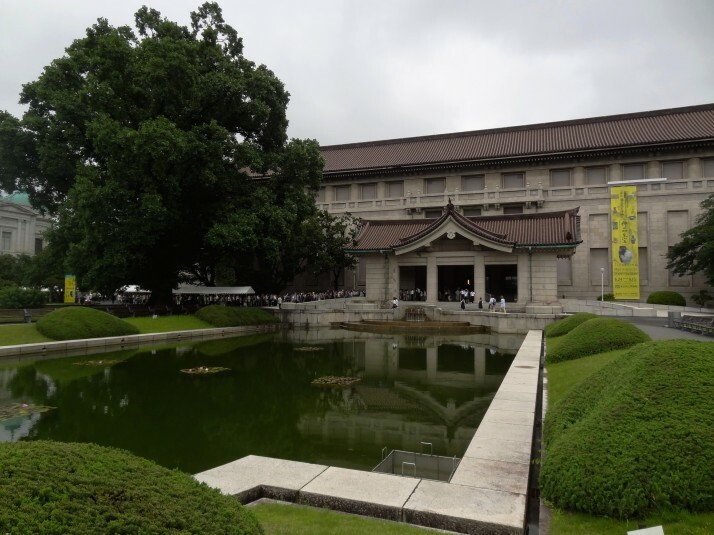 The Tokyo National Museum is the longest running museum in Japan, and its collection is about 114,000 items of which only 4,000 are on display at any given time. 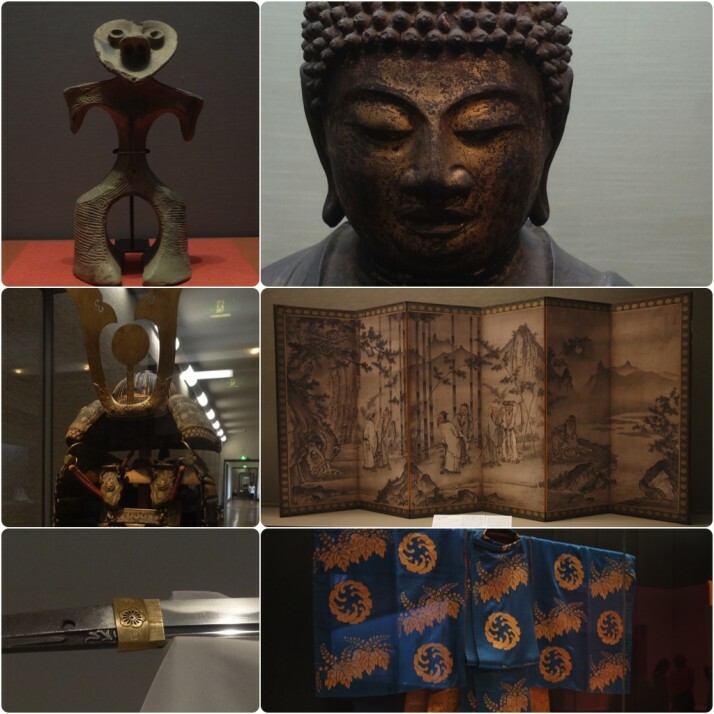 While many museums would try to display as many items as possible, the TNM’s starting point – the second floor of the Honkan building – presents just a handful of antiquities per era which gives a nice taster of the periods in Japanese history. 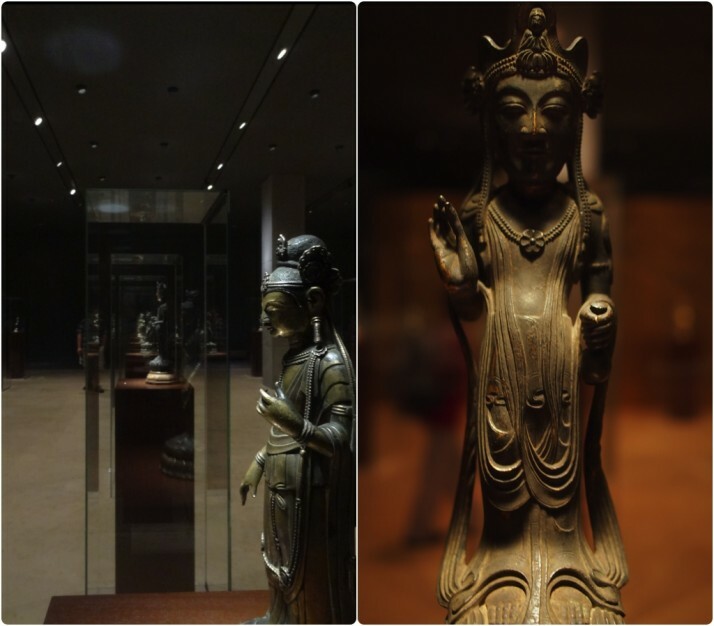 The ground floor is then given over to rooms filled with antiquities by genre or type – Buddha statues, pottery and ceramics, samurai swords, theatre costumes, etc. We loved the layout – it was a really good way of holding our interest and keeping our attention. All too often in museums we find ourselves fatigued at having looked at so many examples of one thing that they all tend to lose their importance. We also visited the very zen-like building of The Gallery of Horyuji Treasures, which houses an exquisite collection of standing Buddha figures. 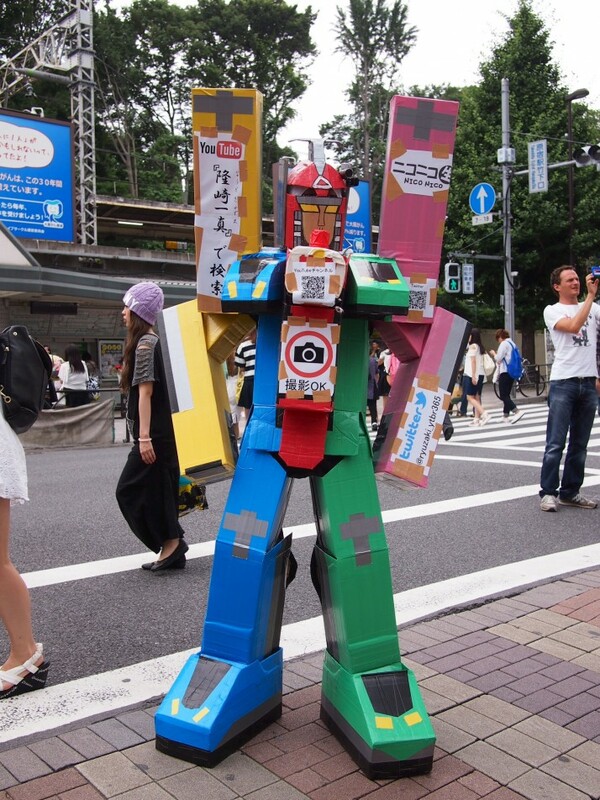 Aside from the Japanese youth culture and fashion, there were a lot of street stalls advertising shows – which is what we assumed this guy dressed as a robot was doing! Harajuku is a suburb of west Tokyo that sits between the exclusive boutiques of Omotesando and the bustle of entertainment in Shibuya, and is known for its sub-culture of alternative fashion style which young people dress up and show off at weekends. Their style inspired Gwen Stefani’s song Harajuku Girls – now you know what she was singing about! 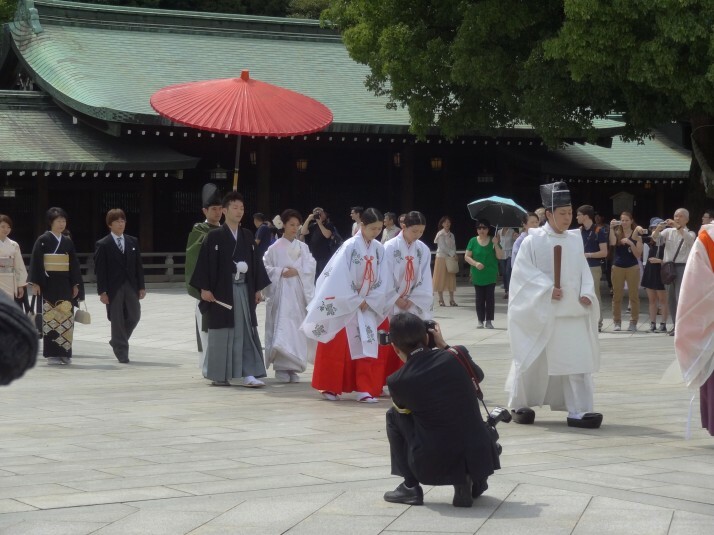 Before heading into the heart of Harajuku, we paid a visit to the Meiji Jingu Shrine and we arrived in time to witness a wedding party parade through the main temple square. 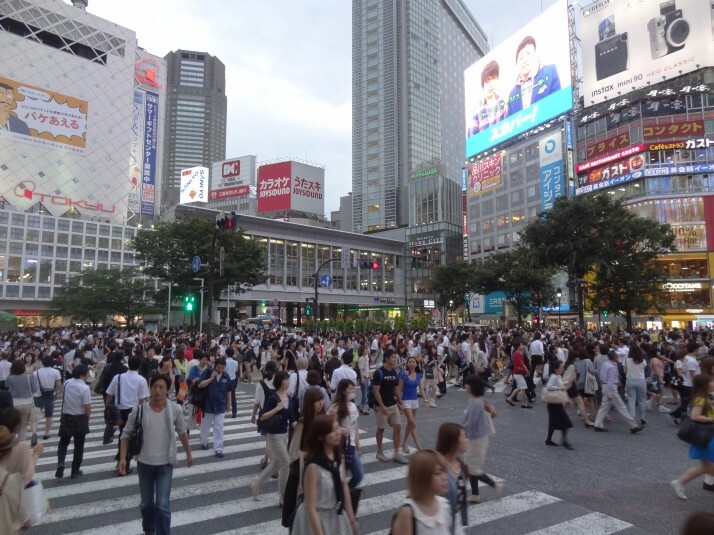 After the Meiji Jingu Shrine, our route through Harajuku took us down the unfortunately transliterated “Takeshita Street”, which was as busy as the Shibuya crossing! 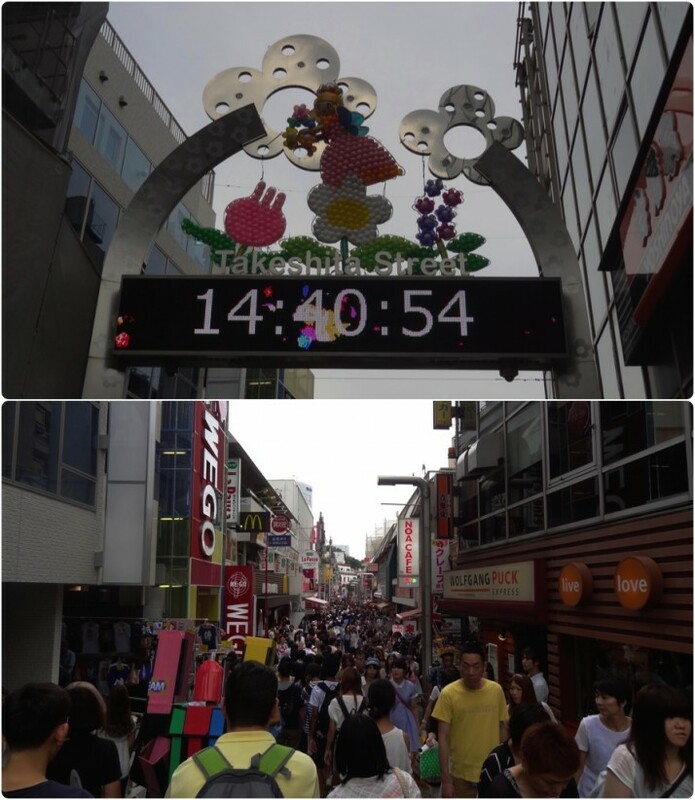 Takeshita Street, the main shopping street for sub-culture fashion in Japan. And crepes filled with just about everything, including cheesecake. Yes, cheesecake in a crepe. Genius. As I’d read, the dressed up locals are few and far between these days and the most outrageous costumes we saw were worn by some of the shop staff! 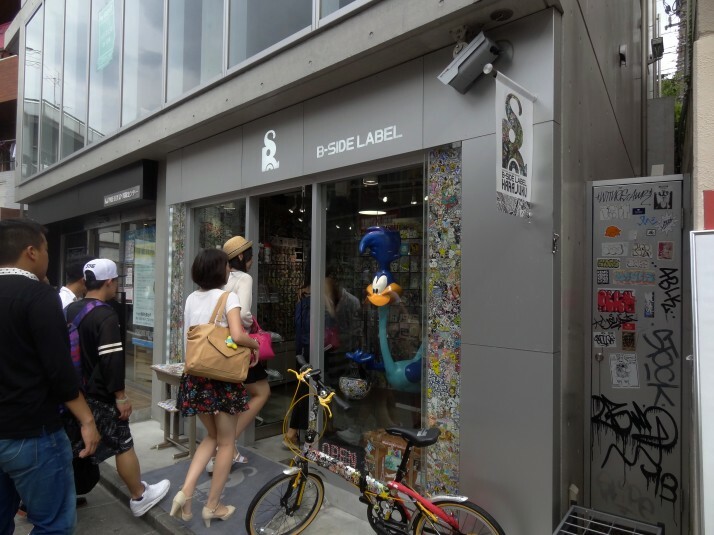 However, our favourite shop of Harajuku was on Cat Street called B-Side Labels – touting original stickers with a distinctly Japanese attitude. I’m not really one for putting stickers on things, but had I spent more time in this shop I would have been converted, they’re fantastic! B-Side Label in Cat Street, Harajuku. STICKER ALL THE THINGS! 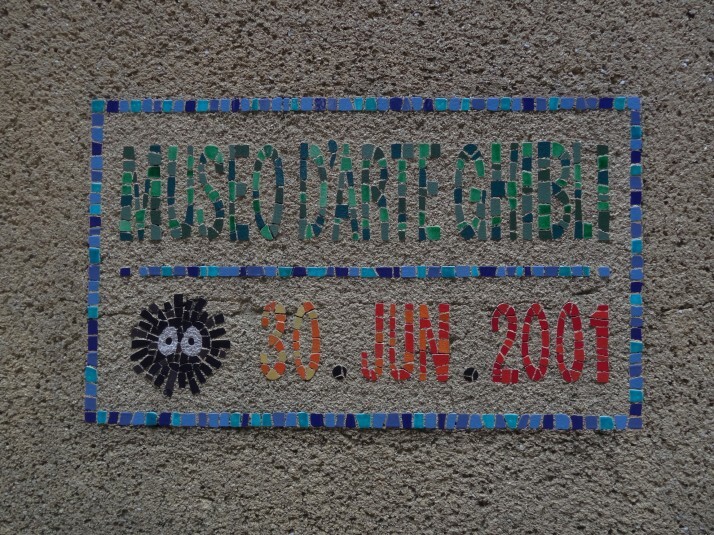 Plaque near the entrance to the Ghibli Museum. I’ve no idea why it’s in French! 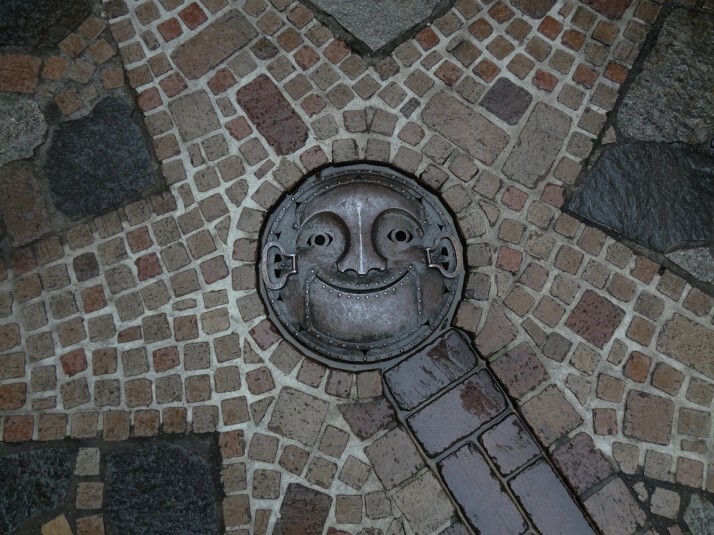 Yes, Julie included the Ghibli Museum in her list of Tokyo highlights, but I had to include it in mine too. I loved the focus it has towards children; lots of little tunnels and walkways for kids to explore, and no set path through the museum – once you get your ticket (which includes 3 frames from an actual Studio Ghibli movie roll) and descend the staircase, where you go is up to you! I hadn’t seen any Studio Ghibli movies before we arrived in Japan, I’m glad we watched a few before we visited, as it was fun to spot the characters hiding all over the building. 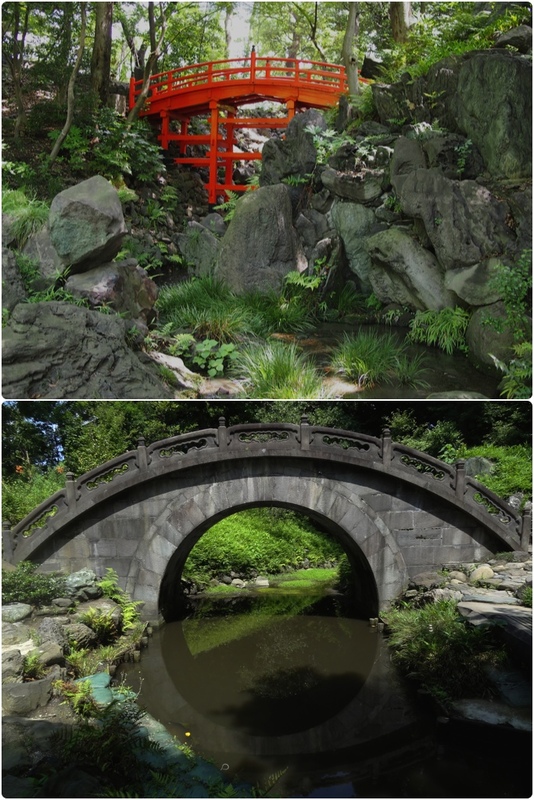 This entry was posted in Experiences, Places and tagged Japan, Tokyo on July 14, 2014 by Andrew. 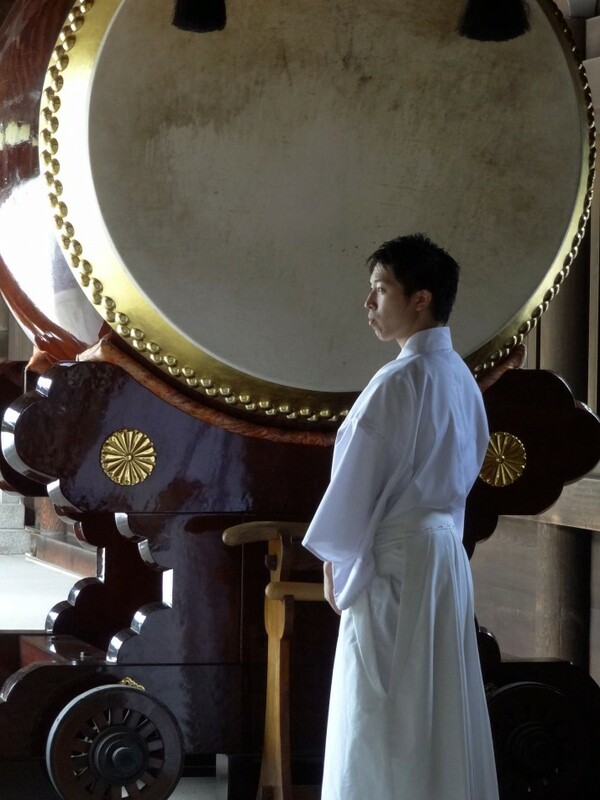 From your blogging I’m fascinated by Japan’s weird mixture of peaceful elegance in its shrines and gardens, and utterly tasteless kitsch in popular culture. I wonder if the latter is some sort of rebellion against the former?